There are about 30.000 puffins nesting on the islands off the coast of Reykjavik and we are only a 15 minute boat ride away! 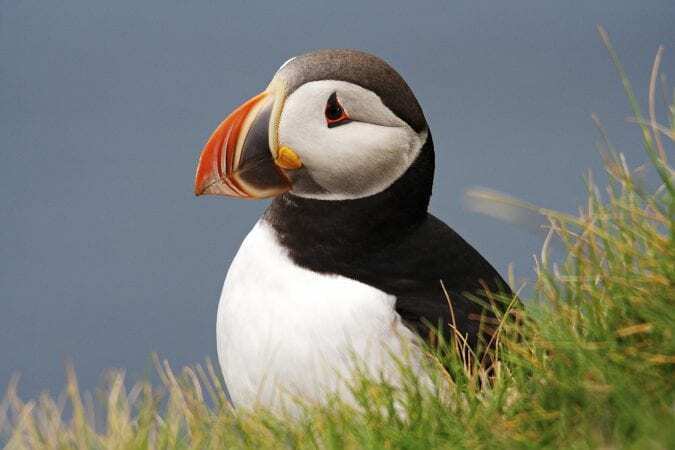 The Puffin Watching tours have been popular for over a decade! We are a pioneer in Puffin Watching with 20 years of experience, and our especially designed boat, makes us the leading expert in the area. Useful Tip: We recommend a good zoom lens for close-up photography as the Puffins are small sized birds. – Binoculars provided on board! – We get you extra close! a reference to the black and white plumage on the body. The Puffin is a migratory animal, and only comes to land once a year to nest. Usually between May and August. It digs a burrow into the ground where it lays the egg. Puffins are extremely good divers, being able to dive down to 60m for food. It is well adapted to life in the water, but is a clumsy flyer.